Physical Characteristics: 6.5 – 8.5 ft. long, 4 – 5 ft. tall, 400 – 1100 lbs., and a tail length of 4 – 7 inches long. During summer has golden brown coat. In winter coat is longer and grayish brown. Head, neck, and legs tend to be darker than rest of coat. Large yellowish-orangish rump patch bordered by black-dark brown fur. Male has dark brown throat mane. By fourth year bull usually has 6 “points” per side of antlers. Bulls shed antlers around March; new ones grow back in late April, becoming mature in August. Diet: Considered grazers or browsers. Sedges/grasses make up 80 – 90% of diet in spring/summer. Woody plants/fallen leaves form much of fall/winter diet. Salt also important. 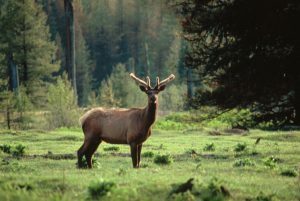 Elk will travel vast distances to eat salt-rich soil. Habitat: Prefer upland forests and prairies; sometimes range into alpine tundra, coniferous forests, or brushlands. In Rocky Mountains, tend to move to higher elevations in spring and lower elevations in fall. Great Fires of 1910 created abundant habitat for elk populations to thrive. However combination of forest succession and lack of stand-replacing fires (1910 fires) has changed habitat type; is largely responsible for population decline in drainage (also referred as Lolo Zone). Severe winters have also produced large mortality. Gray wolves have been scapegoated for decline of herds. Range: Northeastern British Columbia southeast to southern Manitoba, south to southern Arizona/New Mexico, and along Pacific Coast from Vancouver Island to northern California. Have been introduced as a game species in many areas. Reproduction: Cows give birth to single calf late May – early June. Gestation period is roughly eight months. Calves stand/nurse within an hour of being born. In 2 – 4 weeks cow/calf rejoin herd; calves are weaned in fall. Weitas Creek Roadless Area on Clearwater National Forest provides excellent winter range and some of best elk calving grounds in Idaho. Threats: Development displaces elk into higher elevations/less productive habitat, destroying critical low-elevation habitat and forage. Flooding/damning (Dworshak Dam) of N. Fork Clearwater is great example. Area historically provided crucial winter-range habitat for species. Road building, logging, invasive weeds and off-road vehicles also impact populations. Miscellaneous: Great runners and swimmers due to long/powerful legs. When sensing danger will raise heads high, open eyes wide, move stiffly, and communicate with each other by curling back upper lip, grinding teeth and hissing softly.